Quiet apartment just 600m from the beach and 400 m from the beautiful center of Mali Losinj, you can hardly ask for more! You will stay high above Mali Losinj, and can walk downhill through the narrow streets and alleys to the picturesque town center. Mali Losinj was founded in the 6th century and for centuries belonged to Venice. The oldest part of the town lies around the 18th-century St. Mary's Basilica, while you will also find beautiful buildings from the 18th and 19th century in the harbour. The lively little centre offers a wide range of theatrical performances, exhibitions, concerts and other events. But you can also enjoy a refreshing drink and a delicious meal, as well as the view over the town and the sea on one of the many terraces at the harbor. Looking for a nice souvenir? You'll surely find something to your liking in one of the many boutiques. The most famous beach of Losinj is the one in the Cikat Bay (2 km), southwest of Mali Losinj. It is 30 km long and a popular spot for water sports and for cycling or walking on the designated paths. The mild climate, the blue sea and the subtropical vegetation make Losinj an ideal holiday destination. You can optionally do guided hiking or cycling tours. Enjoy the stunning views and the panorama of the beautiful coastline. Perhaps the best way to get to know the island is from the sea. In the port of Mali Losinj you can book various boat excursions to neighboring islands. Susak, the island of sand and beautiful beaches, and Ilovik, the flower island, are definitely worth a visit. Did you know that the sea around Losinj is known for its dolphins? The Losinj Marine Education Centre studies and protects these magnificent animals. More than 150 dolphins have been identified until now, and have even been given a name. Visit the information center in Veli Losinj (5 km) and learn about the lives of these mammals and this extraordinary project. These are just a few examples of what you can do during your stay in apartment Ana. We haven't even talked about the island of Cres, which is connected through a bridge to the island of Losinj and therefore easy to visit. In short, there is much to see and do, time will be too short! Basic groceries 300 m. Supermarket 1500 m. Restaurant, post office, bank and bike rent 400 m. Fishing 600 m. Tennis 2 km. Apartments Anna consists of two apartments, one of which is offered here. The ground floor is the home of the friendly owner. You have a (shared) terrace with sitting area and BBQ. Neatly kept apartment (90 sqm) on the first floor. 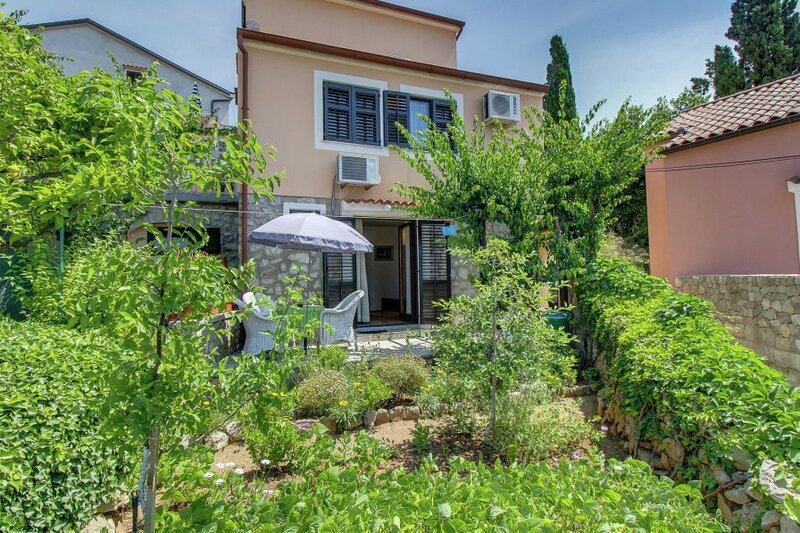 Entrance through a small private terrace with garden furniture and views of Mali Losinj. Living room with comfortable seating, TV and dining area. Open kitchen with fridge / freezer. Bedroom 1: a double bed and a single bed. Bathroom with shower and toilet. From the living room stairs to upstairs: Bedroom 2 (very spacious): a double bed and en suite (second) small bathroom with shower and toilet. Parking at 100 m distance.